In June 2012 people all over the world will watch the planet Venus transit across the Sun. Venus will pass directly between the Earth and Sun on the night of June 5th and the morning of June 6th. This historic event can be seen, at least partly, from many parts of the world and will not happen again for 105 years! I’m part of a collaboration which, amongst other things, is broadcasting this once-in-a-lifetime event live, via the web. Because of this connection and others (our Planet Hunters project at the Zooniverse is all about planets transiting in front of stars) I’ve been reviewing aspects of the event and thought I’d summarise some of it here. Since the invention of the telescope, 400 years ago, Venus has crossed the face of the Sun just 7 times. The Sun, Venus and Earth do not align very often, and the tilted orbits of the bodies in the Solar System produce a repeating pattern of transit events on different cycles. Transits of Venus repeat in patterns of 8 years, 121 years and 105 years. The 2004 transit of Venus was part of an 8 year cycle with this year’s event, and the next event will be in 2117, 105 years from now. In 1627, Johannes Kepler (of Kepler’s Laws fame) became the first person to predict a transit of Venus, by calculating that a transit should occur in 1631. Unfortunately he also calculated that it would not be visible from Europe and so no one was able to observe it at the time. Kepler had predicted transits in 1631 and 1761 and a near miss in 1639. However, Jeremiah Horrocks, a British physicist and clergyman, made corrections to Kepler’s equations for the orbit of Venus and realised that they came in 8-year pairs – meaning that the 1639 transit would not be a near miss, but the real thing. He worked with a partner, William Crabtree in Manchester, to make observations of the event for the first time. He made the first calculation for the distance to the Sun, and the most accurate at the time. The story of Jeremiah Horrocks is fascinating by itself – look him up. For the 1761 and 1769 transits of Venus, the scientific community undertook a huge international, global campaign to measure the distance to the Sun. It could be one of the first major international collaborations. It involved nations working together to cross the globe, in the name of science, for the betterment of mankind. The Seven Years’ War was going on during the first transit, which must have made the observers nervous to say the least. During the second transit things were still hostile between Britain and France, but even they managed to overlook their differences and allow safe passage for scientists and their vessels through disputed waters. In 1716 Edmond Halley (for whom the famous comet is named) had devised a method for determining the distance to the Sun by observing a transit of Venus. Halley never saw the event, he died in 1742, but the world was ready and willing to make the most of a once-in-a-lifetime observation. Observers were sent around the world to watch the transit from different locations. One such observer was Captain Cook, who sailed the HMS Endeavour to Tahiti to measure the transit, and who went on afterwards to explore the Southern Hemisphere and discover Australia (something they definitely did not tell tell the French!). The collected observations of the 1761 and 1769 transits allowed French astronomer Jérôme Lalande to calculate the Astronomical Unit with more precision that ever before. He found a value of 153 million km, the value today is 149.59 million km. This enabled the size of the Solar System to be determined more accurately than had been possible before. The 1874 and 1882 transits were observed with even greater precision, allowing American astronomer Simon Newcomb to arrive at a value of 149.59 million km. Even though we use even more precise methods today, this is essentially the correct distance to the Sun. Newcomb used data from the current and previous transits to arrive at this value. This map below shows the parts of the Earth where you can see the Transit of Venus in 2012. For many, the Transit will only be partly visible and hence the need for a live webcast of the event from Australia, Japan and Norway. The GLORIA group, and many others, have also produced educational materials that let you attempt to measure the distance to Sun yourself, if you fancy having a go. The transit takes several hours in its entirety and is broken down into specific events. 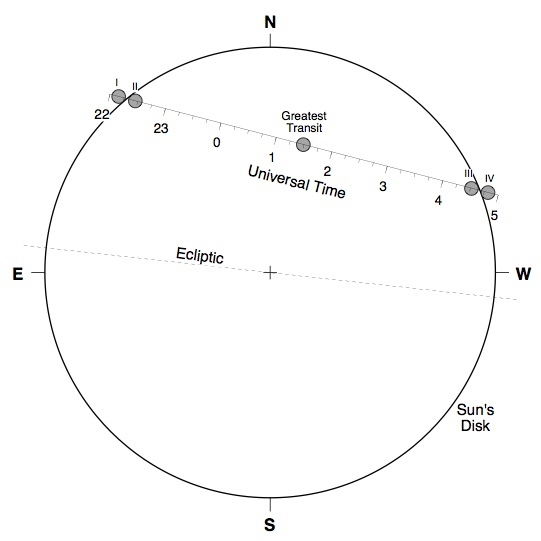 First Contact is when the disc of Venus first touches the disk of the Sun (22:09:38 UT), Second Contact is when the whole of the disc of Venus is silhouetted (22:27:34 UT). Third contact happens when the disc of venus again touches the edge of the Sun as it exists the disc (04:31:39 UT). Fourth Contact marks the end of the transit (04:49:35 UT). These contacts are marked in numerals on the diagram below, along with the time of point of greatest transit. These diagrams come from the NASA’s observers handbook site. 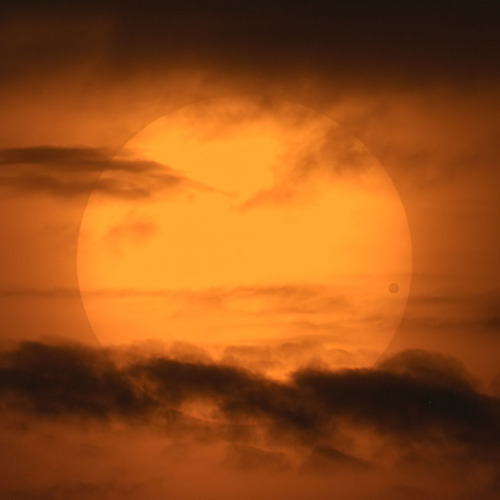 To learn more about the Transit of Venus, visit http://www.transitofvenus.org, where can also grab a smartphone app to tell you where and where to look from any location. In 2004 I gathered a small group to watch at sunrise as the Transit began – none of them were astronomers specifically, but the last-chance-for-a-lifetime line may force me to gather a group again this year. To learn about the various ways to watch the transit – in real life or online – see this handy guide.